Breakfast is my toughest meal. Without gluten, dairy, or eggs, I typically go for smoothies, fruit, and plain, non-dairy yogurt. When summer hits, I add the Acai Bowl into the rotation, and it’s always one of my faves. Packed with sweet berries, acai, and banana with your favorite non-dairy milk, whipped up into a smooth, creamy, sorbet-like frozen custard, it’s like dessert for breakfast. Does it get any better? 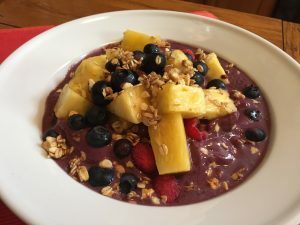 Acai is an indigenous berry found in the rain forests of the Amazon, and for centuries has been believed to be a healing, immune-stimulating, energy-boosting fruit. Acai berries are low in sugar, but contain a good amount of iron, calcium, fiber, and vitamin A. They also contain anthocyanin compounds which give fruits and vegetables their color and team up with flavonoids to defend the body against harmful free radicals. In fact, acai berries contain 10 to 30 times more anthocyanin power than red wine. Where Do You Get Acai Pulp? I use the Sambazon Acai Pulp. I find it at Whole Foods or most natural markets. I’ve even found it on Amazon. I like this acai pulp because it’s organic, and most articles I’ve read recommend consuming organic Acai to get the most antioxidants. When it comes to antioxidants less is not more. More is better! Plus, Sambazon offers an unsweetened organic pulp, which is a great option. I like to add protein powder to make mine a true power breakfast. That way I get all those rich antioxidants and fiber from my fruit, a little good fat from my milk, and 20g of protein plus a little gluten-free granola to keep me going. As with all smoothies, you can add other powders or supplements. Just be sure to adjust your liquid amount if you start adding a large amount of add-ins. 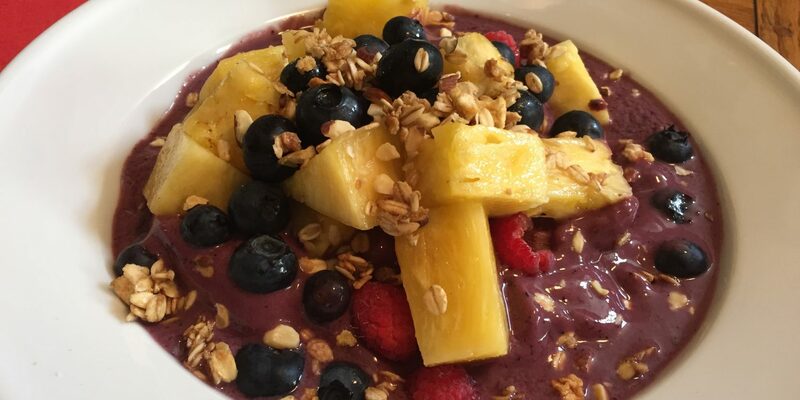 Your Acai bowl should be thick, but smooth and creamy. 1 1/2 tsp flax oil for super Omega 3 boost! 1/4 cup strawberries or goji berries for super antioxidant power! Or use any fruit you like! Blend on low until larger chunks are broken down, then gradually increase speed to high once ingredients have come together. If your blender needs help mixing the ingredients, add a small splash of milk to help. Pour into a bowl and quickly add your desired toppings. Your Acai Bowl will melt quickly, especially in summer!